Firstly, I want to apologise for being MIA on here this past couple of months. Without going into too much detail, we had a serious illness in the family and as much as I usually find blogging to be therapeutic during stressful periods, I've instead put all of my free time into visiting my family member at the hospital. Things are slowly looking a lot more positive now so I thought it was about time to get back on here and start blabbering on about beauty and fashion again! Now that's out of the way; if you follow me on Instagram then you probably already know this, but just over a month ago I had a silver/grey balayage on my hair and I loved it! I'd been toying with the idea for quite a while, and had previously coloured my ends a nice silvery-blonde a few months back, but I was still desperately pining after full on granny-chic grey. So after photoshopping about a billion selfies to see if it would suit me, I finally bit the bullet and booked myself an appointment at Indy Hair in Leicester. (For those of you wondering, a balayage is somewhere between highlights and an ombré; the roots are usually left untouched and a lighter colour is blended through using thin, natural-looking strokes.) My colourist, Becky did an amazing job blending the bleach in so seamlessly, as its grown out really nicely. After the bleach the girls then applied a mixture of blue and white toner to my hair, and managed to get it to a beautiful steel blue/grey colour which I love! FYI I'm currently an ashy blonde as I'm trying to get all the product out my hair so I can go for a follow up session, to achieve silver/white! 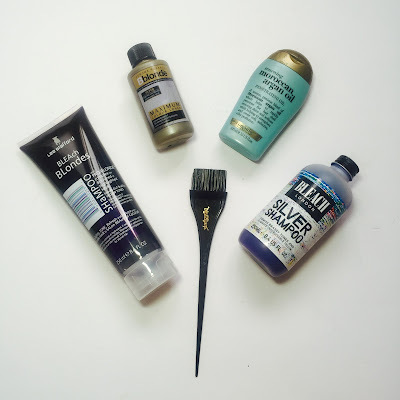 Tips for going silver and maintaining the colour! 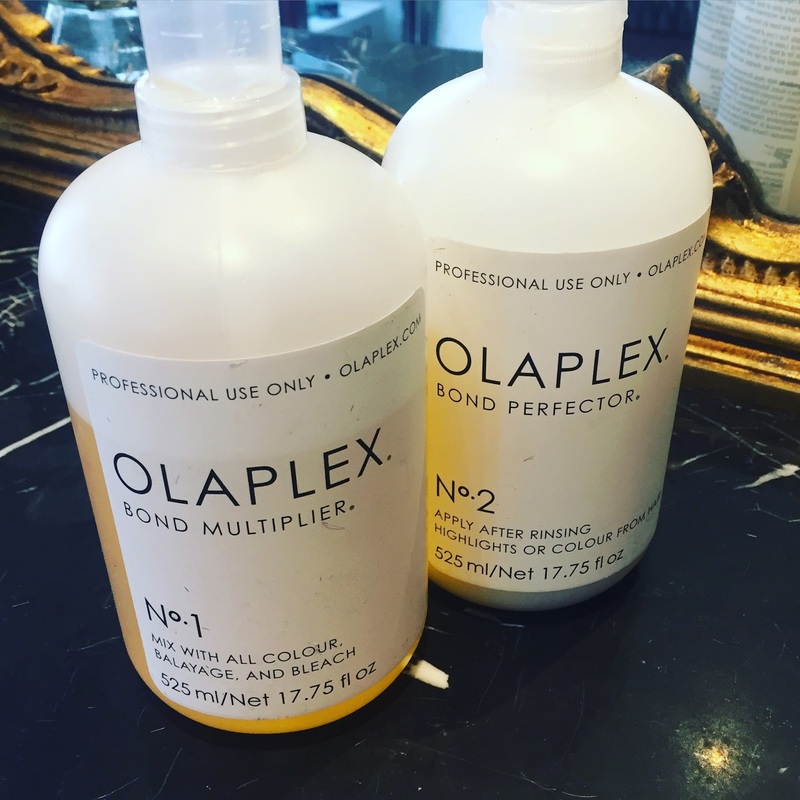 I'll start with the most important one: Olaplex! Bleaching your hair can be such a damaging process and Olaplex is a great three step treatment that minimises breakage, and reforms bonds in your hair. Step 1 and 2 are done in the salon, and Step 3 is an at home treatment, that is used like a deep conditioner. I honestly couldn't recommend the stuff enough; it left my hair feeling so silky and strong, despite the hours of bleaching and colouring, and it stayed super soft for around 4 weeks. Pricing depends on salons but it adds roughly £30-50 to your bill, but it is totally worth it IMO. Lighten your hair in stages! If you want to keep your hair as healthy as possible, then lighten it over several sittings else your hair could get very brittle very quickly. And that's not good! As I mentioned earlier, I'm going back for my second session and I started off as a light-brown, with a medium blonde ombré. Do your research! Read online reviews for salons, speak to friends and go for consultations, (they're free!) Silver hair isn't achievable for everyone, and can be a long and costly process so be sure you want it before you commit to such a serious shade. There are plenty of free apps that allow you to change your hair colour, so edit a few selfies and get some opinions from your bezzies! Make sure that you go to a salon that you love, and get a consultation with your colourist, so you're on the same page. Indy Hairdressing in Leicester was absolutely amazing with me, they were all so friendly and hands on, and Indy himself was as excited as I was about my colour, so it was a great experience. Use silver shampoo to maximise your colour in between toning sessions. When choosing a "silver" shampoo, it's 100% the darker the better. I'd always recommend opening up the tube in the shop (shh whilst nobody's looking!) 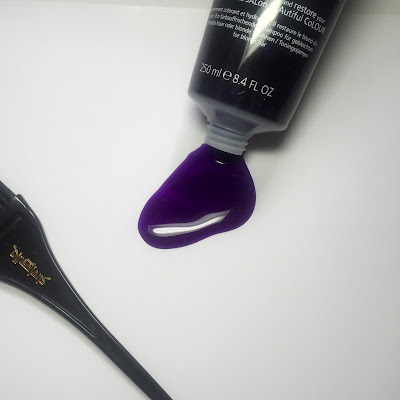 just to double check that the product is a dark purple or indigo, else it's definitely not going to do an awful lot! Don't be fooled by packaging, I've had a Charles Worthington shampoo that stated it was purple and was actually more of a lilac when I opened the tube; and it did sweet F.A. for my hair. Yeh, thanks for that CW. So, that's about it from me, again sorry for the absence, but I'm back for good now! Any suggestions on what you want to see on the blog, as always, are welcome. It requires a lot of courage to make the color you actually desire, and then even have the courage to do it yourself. Your grey shade looks gorgeous.